Unity partner Kii (www.kii.com) recently integrated its Game Cloud service into Unity’s SDK, including cloud backend, custom analytics and user and data management. 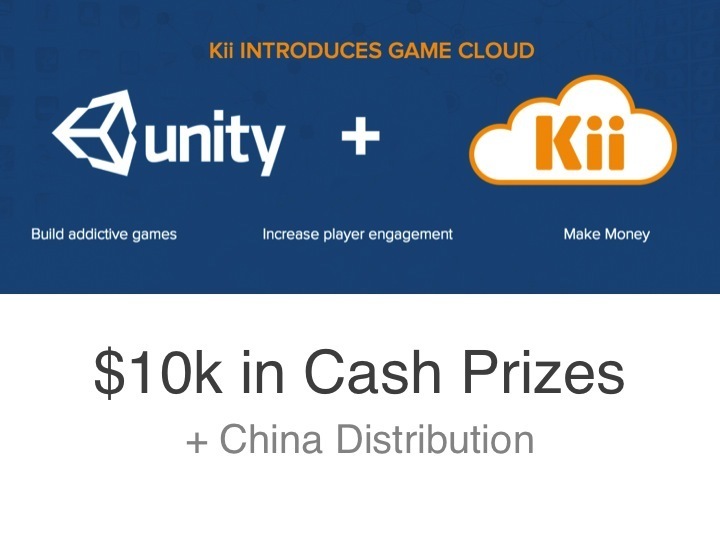 Now Kii is challenging game developers working on a new mobile game to add Game Cloud features to it, and compete to win $10,000, along with distribution in the world’s largest and highest monetized mobile markets: China and Japan. Submit YouTube gameplay video and/or your game by end of May 16, 2014 (Pacific time) through the form: http://Kiigames.challengepost.com. Be sure to include your full name and Twitter account (if any). Game must not yet be published on Apple or Google Play or Amazon before the commencement of the contest — January 28, 2014. After being notified by Kii, the 10 selected Finalists must submit a fully playable build, if you have not already done so, to Kii + Unity for judging by May 16, 2014. All entrants retain full ownership of their submission, but must allow Kii to feature their games, game artwork and logos on Kii and Unity sites, social networks, and promotional materials. Entries must be “PG-13” (no explicit violence or sexual elements). Game must not yet be published on Apple or Google Play/Amazon before the commencement of the contest -- January 28, 2014. - All entrants retain full ownership of their submission, but must allow Kii to feature their games, game artwork and logos on Kii and Unity sites, social networks, and promotional materials. - Entries must be “PG-13” (no explicit violence or sexual elements). 4) In the video’s and/or game’s “About” section, include short description of game and how the entry will use Game Cloud features. Also must include this text and link: “Follow contest results on Twitter “@kiicorp”. 5) Submit the YouTube video and/or game link from your ChallengePost account: http://Kiigames.challengepost.com. Be sure to include your full name and Twitter account (if any).